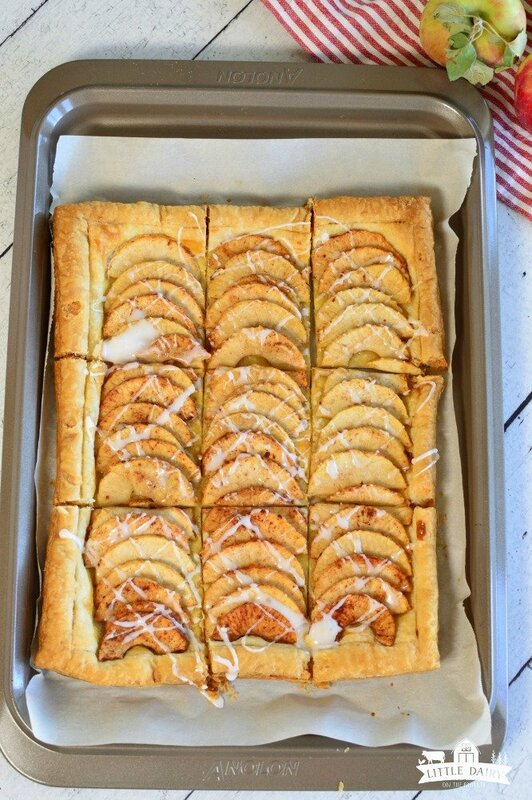 Your house is going to smell amazing when you bake this Simple Puff Pastry Apple Tart! 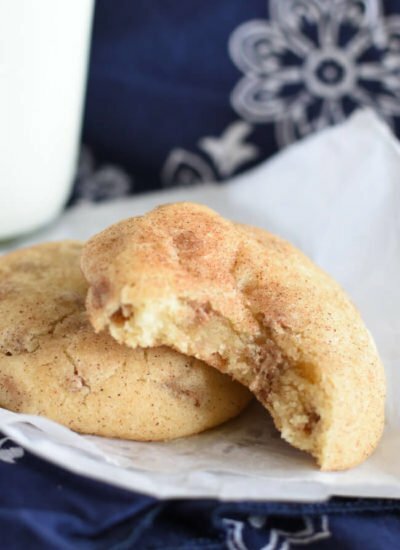 This dessert is every bit as delicious as apple pie, but not having to make a pie crust is a game changer! It’s exactly what fall should taste like! NOTE: This pictures and narrative in this post were updated in 2018. 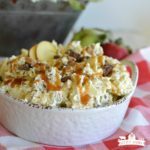 The recipe is still a favorite and hasn’t changed! Carson, my oldest, is always begging me to make him and apple pie. Except he chooses to use the most interesting words when he talks. He doesn’t ask me to bake him and apple pie, or even to make him a pie. Instead he asks if I will “build” an apple pie for him. I’m not sure where he comes up with these words, but that’s the way he talks. When your son asks you to “build” him and apple pie there’s a part of you that wants to run in the kitchen and whip that pie up. You know, because you love your kids and you’d do anything for them? Then there’s that little part of you that wants to tell him to learn to “build” his own apple pie. You know because you want them to be successful adults and be able to do things for themselves. I’m happy to teach him, I just want him to help! But there’s the reality part of my mind that tells me I don’t have time to make, bake, or build and apple pie regardless of who is helping me. 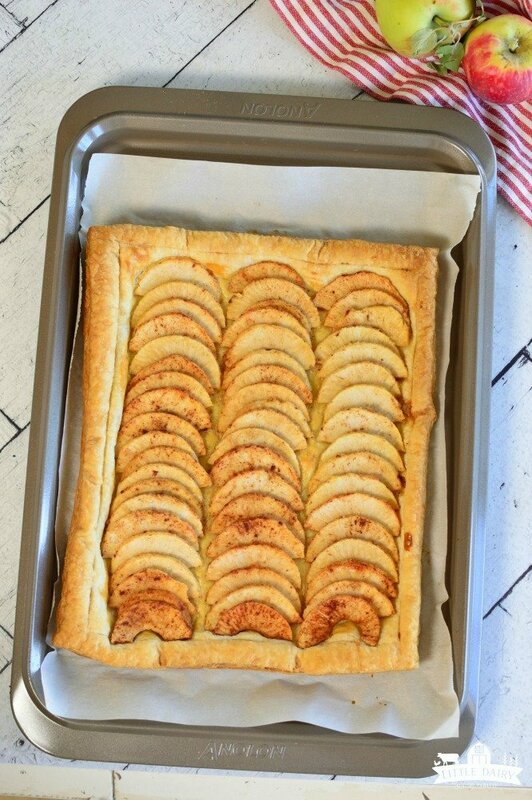 That’s when we say hello to Simple Puff Pastry Apple Tart! This dessert satisfies his apple pie cravings without needing to know how, or having enough time, to make a pie crust! He’s a happy boy, and I’m a happy mamma! Unfold puff pastry. If it has tears gently press them back together. You may need to moisten your fingers with a little water to help it stick together. Roll it out on a lightly floured surface. Create a 1/2″ border around the edges of the sheet. Be careful to only cut part way through the sheet. This helps the apple filling to stay in the middle and the outside edge to puff up creating a nice little edge that helps keep the filling inside. Brush just inside the border with beaten egg. Peel, core, and thinly slice apples. Toss with lemon juice, sugar, spices, and seasonings. 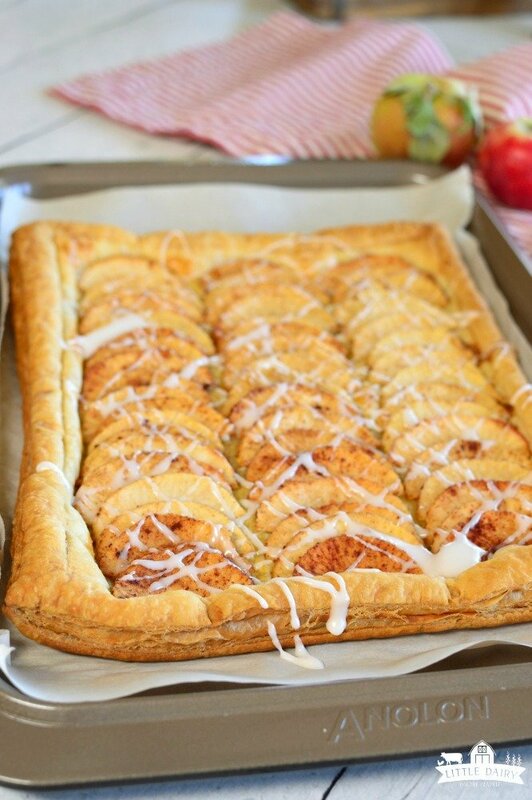 Arrange apples over puff pastry. What are the best apples for baking and eating fresh? There have been a few questions about how to get the apples without being too crunchy or too soft. Some varieties of apples are better for baking and some are better for eating fresh. It seems like there are more and more multipurpose varieties available than there used to be. I love that because I don’t want to have to buy and store a couple different kinds of apples, remember which is which, and try to teach my kids which is which. I already feel overwhelmed! Here are a few of my favorite apples that are great for cooking as well as for eating fresh. The other day I went downstairs to see exactly what Carson was doing down there. As soon as I got to the bottom of the stairs I heard him blasting his George Jones CD, yes he listens to super old country music and yes he still has a CD player and loves it! He truly was born a hundred years too late! “What in the world are you doing down here”, I asked him when I walked through his bedroom door. He informed me, “I’m cleaning up my property!” Like I said, I’m not sure where he comes up with these words and I’m not going to complain because he I saw his bedroom floor for the first time in a while! 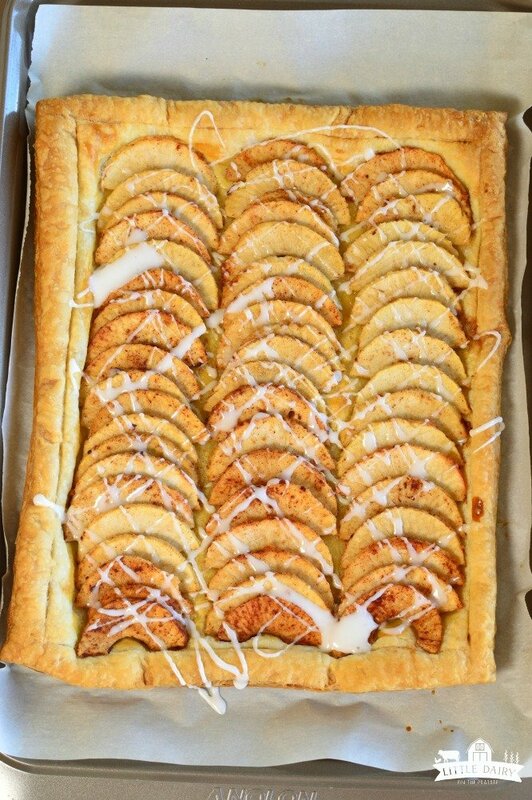 Anyway, enjoy your teenagers and enjoy this super scrumptious Simple Puff Pastry Apple Tart! This mouth-watering tart looks like it took hours to make and will impress any guests. It can be our little secret that it's incredibly simple to make! Thaw one sheet of puff pastry until room temperature. Roll out into a 8" x 14" rectangle. Transfer to a parchment lined baking sheet. Score edges of puff pastry creating a ½ inch border all around the pastry. You don't want to cut all the way through. Just make a score. Brush pastry, inside of border, with beaten egg. Peel and slice apples. Toss with lemon juice. Melt butter in a mixing bowl. Mix with cinnamon, a dash of salt, and brown sugar. Add to apples and toss together. 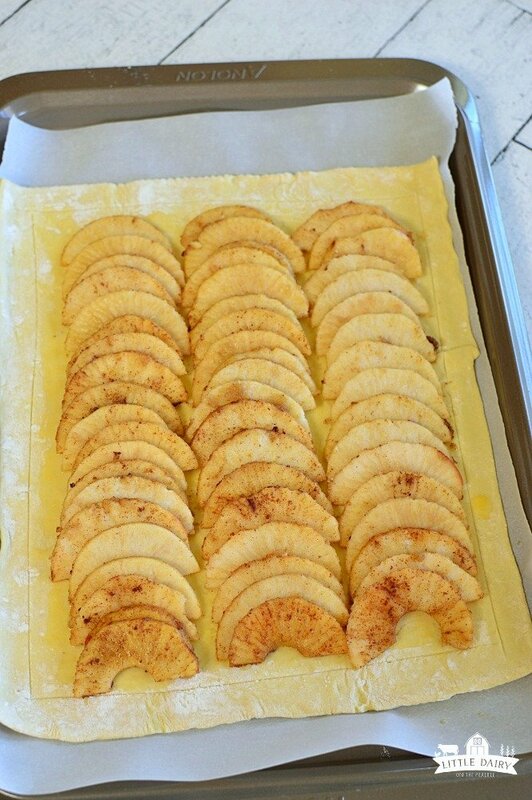 Arrange apples as desired over puff pastry making sure to keep them inside scored border. Pour any remaining brown sugar mixture over apples. Bake at 30-35 minutes or until apples are tender and pastry is golden brown. Warm vanilla frosting in microwave until it reaches drizzling consistency. Drizzle over tart. 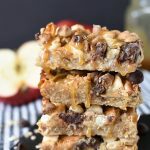 This was a major hit in my home! I made it with apples, pears, and a dollop of vanilla ice cream…SO DELICIOUS! Thank you for sharing. Pears would be so yummy with this, and yes of course vanilla ice cream. Always vanilla ice cream! Pears would be so yummy added to this. And of course vanilla ice cream, always! Hi Amy, this looks great! Do you think it would be possible to leave off the egg? One of my boys has an allergy. I want to experiment but I don’t want to waste ingredients if it’s vital. Thanks! Hi Seanna! I think you could easiely leave the egg off. It helps to make the pastry turn that gorgeous golden brown color! Good luck! Do you fold the scores edge in after scoring it? I don’t see that step in the directions but how else does it form an edged crust? I’m not exactly sure how the magic happens but it happens! Just score the edges before baking and they create a crust while it bakes! It’s so easy! Okay, so according to the way I read the directions, the egg goes under the apples??? I thought it would go on the border. Please clarify. Yup! The egg gets brushed right over the puff pastry before adding the apple mixture! It turns out perfect! This is becoming a standard in our house for just the two of us or company. 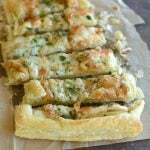 So easy, I have never used puff pastry before and will now never be without it in the freezer. I reduce the sugar and drizzle my apples with homemade boiled cider before baking for an extra rich apple taste. Aren’t quick and easy recipes the best? I’m going to reduce the sugar next time I make it! Hi Michelle! A “T” of butter is a Tablespoon, which is .5 ounces! Hope that helps! I had some puff pastry left over and made this, was easy and delicious. Will bd making it again! I am making your tart for our New Year’s Eve party. It’s looks great except I’ve already doubled the time and the apples are still raw. I’m using a professional oven that is excellent so it must be my apple type I chose. I am go8ng to give it a third 20 minutes (an hour) and hope it bakes. It looks good, just raw apples seem not quite right. Thanks for easy recipe. I usually make excellent apple pie as I’m a pie crust expert but too much work for 20. It would depend on the type of apples you use. You could always steam, or sautee them for a few minutes before setting them on the apple tart just to let them cook a little first! Hope your party was fantastic! I made this recipe but it was still raw in the middle as was my apples but more so the dough was raw in the middle please help !!!! Hmmm! I’m not exactly sure why it’s not baking all the way through. Some varieties of apples take a little longer to soften than others which could affect baking time. I’m wondering if your apples were extra juicy causing the crust to be too moist? You could always steam your apples a little bit before adding them to the crust so they are more tender. Hope that helps! Was in a hurry and this is what I found first on Pinterest. This recipe is incomplete, instructions are missing and having never used puff pastry before, I realized too late that the egg should have been brushed over the whole pastry before putting the apples on top. I am hoping this turns out, but I somehow think he crust will be soggy! Please reread your instructions and ingredients before posting. Not happy with this, maybe you should fix the post and clarify your instructions!! Hi Donna! Sorry for your frustration! I’m not sure what is missing from the ingredient list. Can you please let me know which ingredients you aren’t seeing on your end so I can get them added. Also, from what I can see step five explains that you need to brush the egg over the puff pastry. Let me know if that step, or which other steps, aren’t showing up on your end and I’ll make sure to get them added. 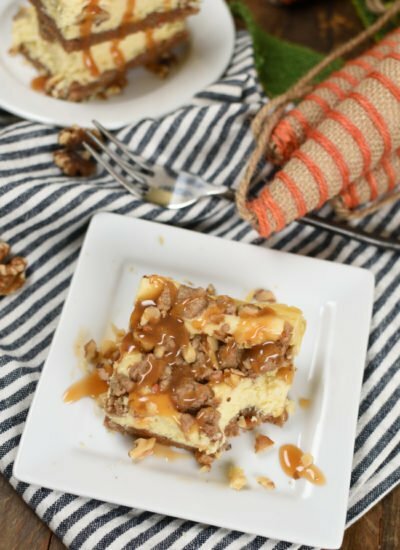 These dessert is so simple and yummy so I don’t want you to miss out because of error on my part! Hi Lesely! 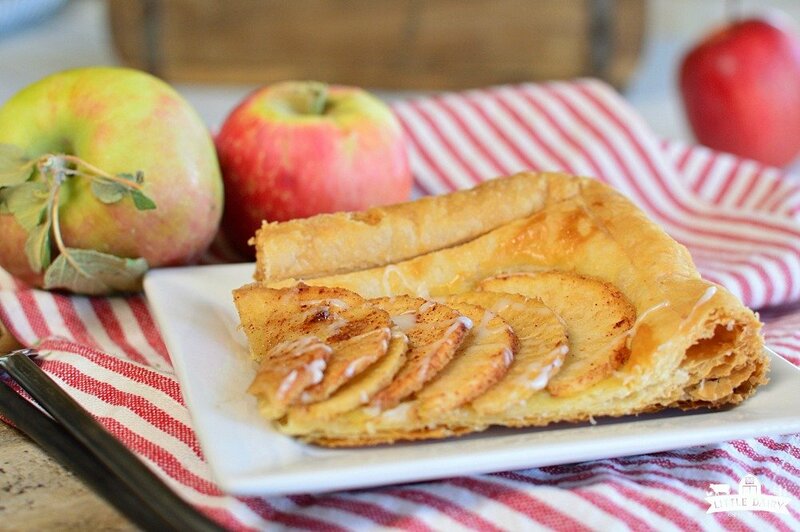 I think your grandson is going to give you an extra hug after he tastes this apple tart! Enjoy your time with him! Amy this tart looks amazing and wonderful that it’s SO simple to make!! 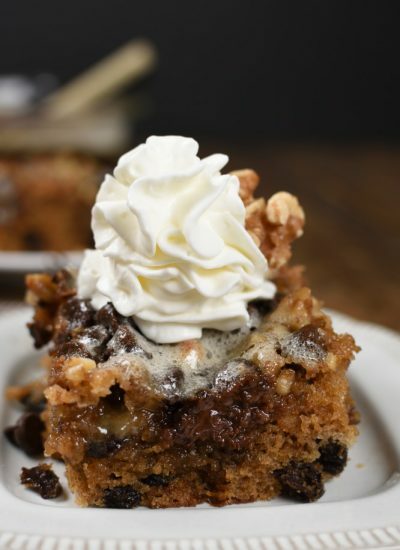 Such a great idea for quick and simple, yet homemade dessert! Thanks Jessica! The simple recipes are the ones we come back to over and over again! So yummy! Do you think this will work with homemade jam? If so, do I add the jam before or after the puff pastry bakes? Hi Elizabeth! I’ve never tried making this with jam, but it sounds delicious! I’m not sure if you add the jam before baking if it will get runny and spread all over the place. Maybe you could make them in individual sizes. I’d probably cut the puff pastry into squares, then add the jam to half of each square, then fold the other half over and seal it with a fork. Then bake it like that. Let me know if you try it! Homemade jam is the best! Excellent flavor, but puff pastry got soggy in the middle. Will try precooking the apples. These are delicious! Sorry they were soggy. I’ve never had that happen to me. I wonder if it’s the variety of apples you used? Hi there. Just wondering what to do with the salt? I see It on the ingredient list but unless I’m missing someting, the recipe doesn’t include instructions on when to add It. Thanks! Hi Beth! Good catch! 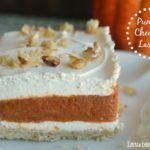 I love adding a little bit of savory to offset all the sweet! Adding just a dash of salt to the brown sugar mixture gives it that flavor I’m looking for! I just updated the recipe. Thanks for letting me know! Enjoy! Looks great. Can you freeze it? Hi Helen! I wouldn’t recommend freezing it, although I’ve never tried it. The crust might get soggy during the freezing and thawing process. Thank goodness it’s pretty easy to make so it’s not too hard to make fresh! Enjoy! I accidentally bought Fillo dough instead of puff pastry…think I can still make it? 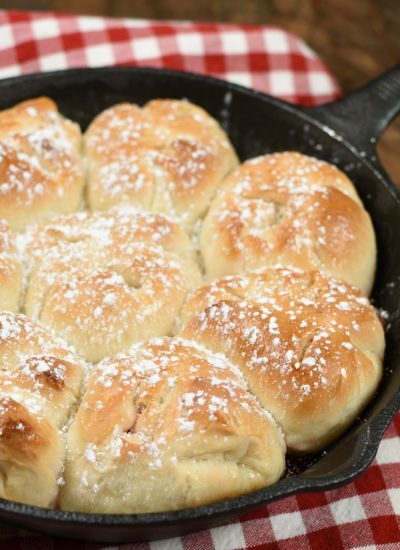 I’ve never tried making this recipe with Fillo dough so I can’t say for sure how it would turn out. I don’t think it would puff up around the edges creating that border though. Let me know how it turns out if you decide to try it! Making this tomorrow but cannot see the frosting part of the recipe? I used one of my favorite shortcuts, a can of vanilla frosting! It’s so quick and easy!